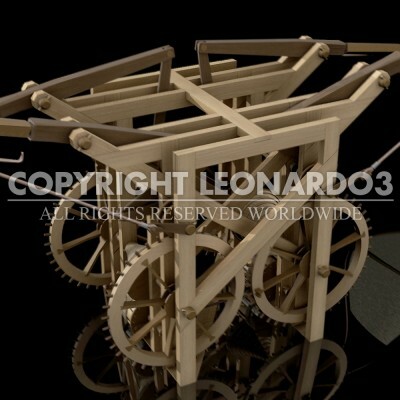 Leonardo was the first person to study human flight in an analytical way, and he used scientific methods to investigate all possible solutions. He developed designs for muscular flight, mechanical flight and gliding flight. The flying machines he designed were not always meant to transport a pilot. In fact, many are simply “study” machines imitating insects and birds. The mechanical dragonfly belongs to this category. 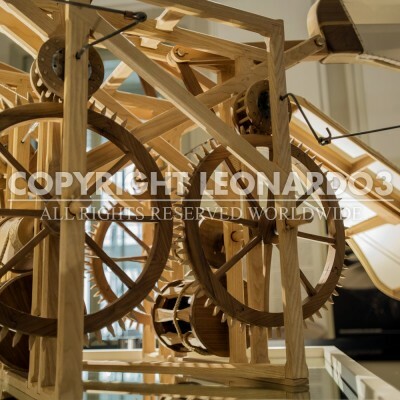 It’s one of Leonardo’s most complex machines. The idea consists of wanting to replicate the beating of a dragonfly’s wings, which is more articulated than just a simple up and down motion. The wings of a dragonfly are flat on the downstroke to push against as much air as possible, while on the upstroke they turn at an angle to meet the least resistance. Leonardo figured out how to imitate this by designing two pairs of wings that rotate around a central pivot as they go up and down. A couple engines activate a complex mechanical system made of gears using a camshaft furnished with connecting rods. While the wings beat against the air, moving quickly up and down, some tie-rods fold the wings down and position them at a diagonal during the upstroke.